Welcome to the definitive guide for .NET performance. 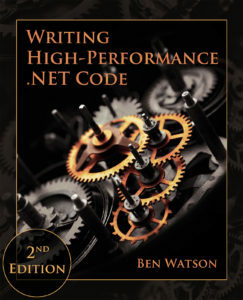 Writing High-Performance .NET Code by Ben Watson is the best-selling book about understanding the fundamentals of .NET performance. It contains detailed explanations, instructions, tools, and tips to help you get the best .NET performance immediately. New 2nd Edition Available Now! The new version of the book is now available! 50% longer, with more tools, more insights, more code, more stories, and more topics! Order yours today and receive it as soon as possible! See what’s new in the 2nd edition. A free sample chapter for the 2nd edition is available. This includes the table of contents, foreword, introduction to the 2nd edition, Chapter 5 – General Coding and Class Design, as well as some of the back material such as bibliography and index. No Dogma – Episode 95 – Had a great discussion with Bryan about .NET perf. Check it out! .NET Rocks – Episode 1545 – A wonderful follow-up discussion where we talk .NET Core, other changes over the years since the previous edition. .NET Rocks! – Episode 1041 – I had a great discussion with Carl and Richard about getting the best performance out of .NET. Definitely give this a listen and subscribe to this wonderful podcast. See retail locations for where you can buy a copy. The print edition is cover price is $24.99 and the eBook edition is a deal at only $9.99 (prices may vary in your country). Some retailers offer significant discounts from that price, however. “This is an awesome book–a must read for performance engineers of all levels, supported with tools, techniques, and statistics.” 5 stars – Bipin P.
“This is why this book stood out; the author used real-life examples to provide clear, concise explanations about the .Net framework. I would recommend this book to anyone who is weighing the benefits of managed-code vs unmanaged code.” 5 stars – Emit B. Learn the secrets of excellent .NET performance with insightful, detailed, and clear explanations. Do you want your .NET code to have the absolute best performance it can? This book demystifies the CLR, teaching you how and why to write code with optimum performance. Learn critical lessons from a person who helped design and build one of the largest high-performance .NET systems in the world. This book does not just teach you how the CLR works—it teaches you exactly what you need to do now to obtain the best performance today. It will expertly guide you through the nuts and bolts of extreme performance optimization in .NET, complete with in-depth examinations of CLR functionality, free tool recommendations and tutorials, useful anecdotes, and step-by-step guides to measure and improve performance. Through this book, you will achieve the best .NET performance possible.